AGTER - Land Policies and Agrarian Reform. Proposal Paper. Part I. How might access to land be guaranteed in conformity with the interests of the majority of the population? (1 of 5). This second question on the distribution of land access is one of the key elements of any agricultural policy. However, the way land is distributed has a far-reaching impact: it affects not only agriculture, but also the entire range of possibilities for economic and social development. This has been the subject of much controversy over several decades and different policies have been implemented in an attempt to solve the problem of optimising the distribution of land resources. Today, the debate focuses on two main notions that are often expressed simplistically and dogmatically: government action to correct unequal access to land (agrarian reforms) and the role of the market. We will see the advantage and need for considering land policies that surpass this dichotomous vision. Before addressing the conditions and policies that permit an optimal distribution of land, we must first recall that small, family farms that employ little or no salaried labour are generally the most efficient economically speaking, and are a fruitful basis for the growth of democratic political systems. Although this assertion was far from being agreed upon in the 19th and early 20th centuries59, it is now widely accepted regardless of the political context. Small family farms not only possess advantages for the environment and the maintenance of the rural social fabric, they are also generally more productive than capitalist companies. Box 12 illustrates the situation in the USA. Similar situations can be found in most countries, in both hemispheres60. The experts of the World Bank, Binswanger, Deininger and Feder came to the same basic conclusion in their work on land polices61. See box # 13. 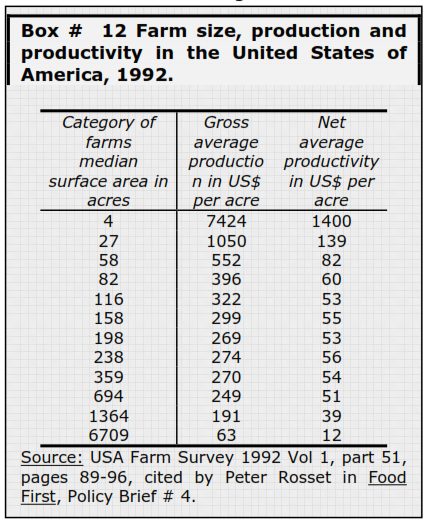 In the conclusion of the chapter devoted to discussing the competitiveness of small farms in their working document written for the World Bank, Binswanger, Deininger and Feder observe that although many empirical studies on the relationship between farm size and productivity lead to methodological problems, those that genuinely consider variations of productivity rather than those of production show that small farms have higher productivity levels than large farms, even in relatively mechanised and developed regions of developing countries. They use the table below to illustrate their demonstration. In most farms, there are no economies of scale. On the other hand, economic activity is more rational when production is managed at family farm level, especially if the small farms are equipped with machinery. Nonetheless, small family farms are not always the most efficient and not all of them ensure the sustainable use of resources63. To do this, they must be able to count on sufficient means and an adequate agricultural policy. This is the case under certain conditions in most of the developed countries. 59 See especially La question agraire by Karl Kautsky regarding Marxist thinking on the subject. 61 Binswanger P. Hans, Klaus Deininger and Gershon Feder, Power, Distortions, Revolt, and Reform in Agricultural Land Relations, Working Paper, The World Bank, July 1993. published in its final form in 1995 in J. Behrman and T.N. Srinivasan (eds), Handbook of Development Economics, Volume III, Elsevier Science B.V. A Portuguese translation of this very interesting paper is available in electronic form on the NEAD Website, under the heading Dataterra. 62 From Binswanger, P. Hans, Klaus Deininger and Gershon Feder, ibid 1993. Portuguese version. 63 The “minifundistas” of Latin America, for example, are often obliged to overexploit natural resources to survive on a daily basis.